Handing in the car keys - 1941, Hastings Park, Vancouver, B.C. After the Pearl Harbor invasion in Dec. 7 1941, the Nikkei along the British Columbia coastal area were subjected to a succession of orders and ordinances that throttled the Nikkei activities and movements. Cars, radios and cameras were to be surrendered. Nikkei owned cars and trucks were confiscated in Vancouver. Motor vehicles from logging trucks to motorcycles were sold quickly by auction without notifying the owners. Homes, property, businesses were confiscated and sold well below market value. 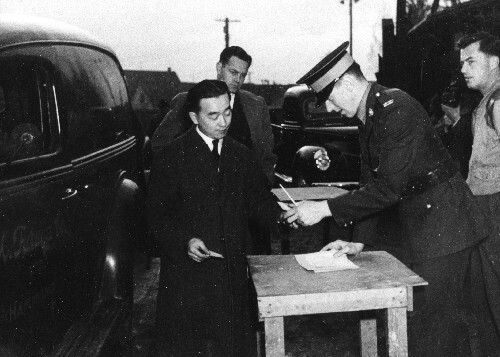 Japanese Canadians were told the money from the sale was used to pay for their internment.